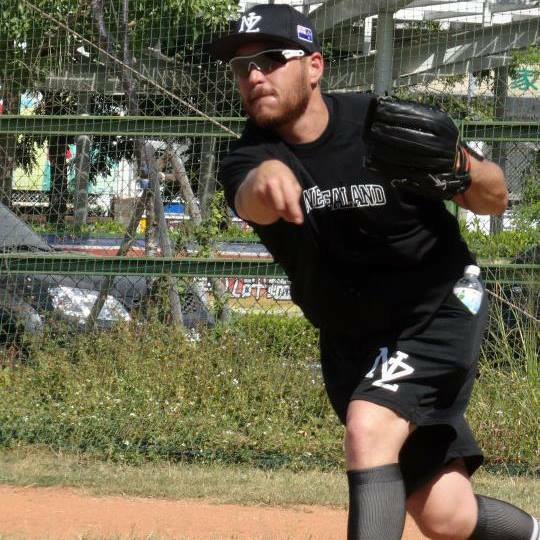 So the reason I dropped down – In 2012 I played for NZ in their first ever WBC birth/qualifier in Taiwan. I had some time off from baseball before receiving the call to ask to play so it was a quick ramp up for me to try and get back up into the 90’s for the comp. IN our second warm up series in Australia, I came in to the game and tore my UCL effectively making it impossible to throw without pain or with any velocity. After the qualifiers finished I came back home with the baseball bug – problem was I could throw well over arm any more and that was when I found I could throw sub/side arm without any pain.. So I worked on it for a couple of months and figured some stuff out to become effective. For me the main advantage is less stress on my elbow, from horizontal down I feel no pain and it gradually pains more the higher me arm slot goes. The other advantages are ball movement and hitter inexperience vs sub. I know I would not have as I was unable to throw over the top. I wish I had of been mature enough to learn to throw from different arm angles during my pro career, DJ Carrasco is a great example of this. I threw 96mph with an 88mph slider over the top, so my coaches very rarely wanted to change anything I did. Being the pitching coach for New Zealand, I fiddle around with kids arm angles until 1 – they feel comfortable and 2 – they are consistent and effective from said arm slot. If anyone feels they want to drop down and they can be effective then definitely. I mean look at Peter Moylan, I grew up playing against him and he was a 1st baseman then one day he broke his back, fiddled around in low level ball and figured out he was super effective as a sub pitcher. Spend a lot of time figuring out your release points… You spent your whole life throwing over top so that I find is the toughest. Fiddle with grips for all pitches including pinching your knuckle for a breaking pitch. I have different approaches depending on the hitter, not necessarily whether they are right or left handed. I’ll use level and corners a lot and pitch to set up/influence a ground ball. I don’t throw hard enough anymore for strikeouts so I use my movement as much as I can.